G-Player plays all your Gigastudio™ sound libraries without any conversion. 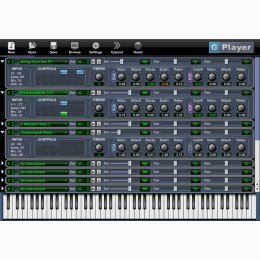 G-Player was designed to play the large orchestral sound libraries and supports disk streaming, dimensions, keyswitches and layered instruments. Forget converting and importing with random results. Save time and disk space. In a Gigastudio™ file, every sample zone has its own envelopes and parameters, this is usually lost when the file is converted to another sampler format that needs to group zones with similar parameters. Not with G-Player. G-Player plays all the samples with the finest level of detail. G-Player was created to emulate the Gigastudio™ sound as close as possible. When other samplers can only improve their Gigastudio™ file import, we work directly on the audio engine until we get a perfect result. For example, G-Player is the only sampler that emulates the 3 velocity curves of Gigastudio™ (linear, non-linear and special). G-Player is optimized for the Gigastudio™ format and is very efficient in memory and CPU usage. G-Player can play and stream the compressed and accelerated samples which results in less hard disk activity than any another conversion based solution. Easy parameter editing: the most commonly used sample parameters are directly accessible on the main window. Multi-layered instruments support with up to 8 layers of crossfade. This feature is used by the most prestigious Gigastudio™ sound libraries and is natively supported by G-Player. G-Player runs on Windows XP. Vista and 7 (32 bit and 64 bit). The stand-alone version requires an ASIO™ compatible audio card. G-Player can play the Gigastudio™ 1, 2, 3 and 4 formats. It can play 16 bit, 16 bit compressed, 24 bit and 24 bit accelerated samples.